Hospice of Santa Barbara looks forward to joining the community to celebrate and honor the lives of their loved ones at its annual Light Up A Life ceremony at 5:30 p.m. at the Seal Fountain at Linden Plaza, Linden Avenue. The Light Up A Life ceremony is scheduled to feature special speakers and guests, delicious hot cocoa and cookies for all, live entertainment, and the lighting of a memorial tree. Stars are available online for a suggested donation of $15 or more and can also be purchased on site for those who wish to personalize a star to hang on the tree. All proceeds will benefit Hospice of Santa Barbara. We hope you will join us for this heartwarming community event. 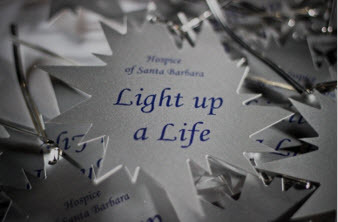 For more information about Light Up A Life, please call (805) 563-8820 or visit http://www.hospiceofsantabarbara.org/light-up-a-life-2017/. Immediately following the Light Up A Life celebration at Seal Fountain, please join us for a Heroes Ceremony where we will recognize our local heroes who have been working tirelessly to keep our beautiful city safe during the Thomas Fire. End the night by coming to the Carpinteria Art Center from 7 p.m. to 10 p.m. for beer, wine, and live entertainment. Throughout the event, attendees will also have the opportunity to support local businesses, who will be open for extended hours. All funds raised from this event will benefit those who have been affected by the Thomas Fire.